Many times I’ve had someone tell me, “I’d love to make fonts, but I just don’t have the creativity.” So I’m going to make a new font that uses nothing but some basic geometric shapes—primarily circles and rectangles—as the building blocks. No lettering skills necessary, just a bit of math! (And I’m totally using my computer’s calculator for that part.) 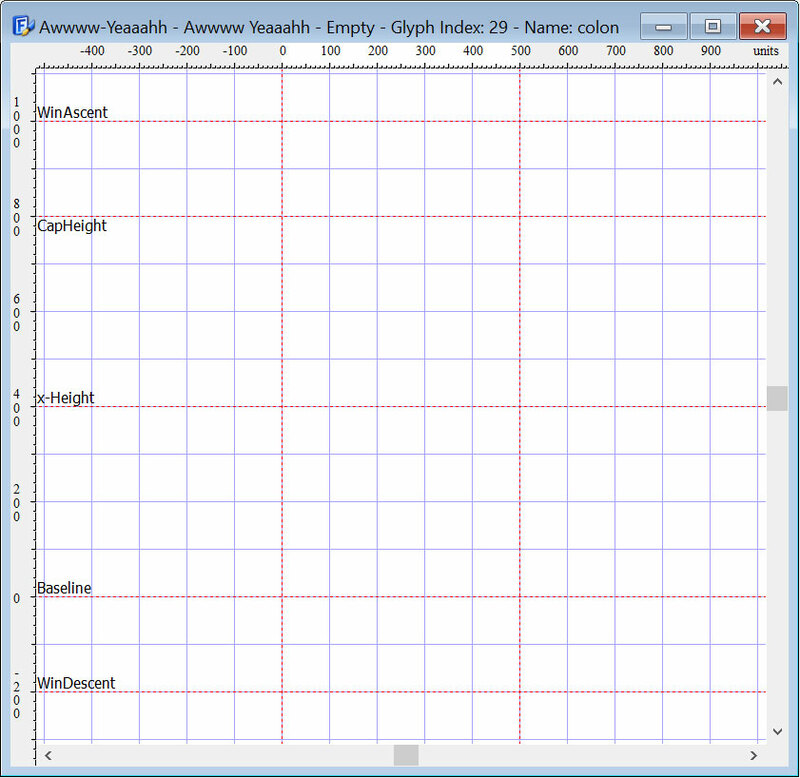 You should also have a basic knowledge of using a pen tool with curves. I’ll be using Font Creator for all of the creation of this one, since it’s my primary font-making program. If you have another program, odds are you’ll have very similar features and options, though they’ll be in different places and possibly named different things. I’m also going to be using the classic font Cooper Black as a reference. I’m not making a copy of Cooper Black, but if I have a question about how a serif should be aligned on a particular letter, I’ll see how Cooper handles it. The first step is to create a new font file. Font Creator insists you give it a name right away, so I usually put something goofy or weird in. You can always change the name later. I may not use them all — some of the items in “Miscellaneous Symbols” are things like a heart and a smiley face, which I put in there in case I want to make them. But I’ll do all of the Basic Latin set for sure, as well as all of the Latin-1, Latin Extended-A, Latin Extended-B, and Latin Extended Additional characters. 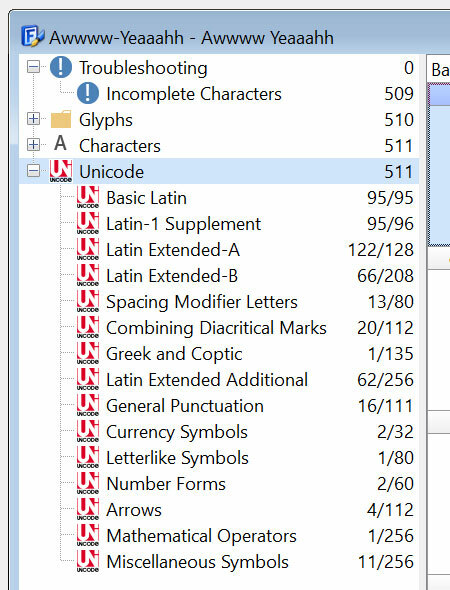 Most of the extended Latin characters are standard letters with accent marks on them, which Font Creator builds really easily from the standard characters and individual accent marks you’ll already have made. Here’s where I’ll set my guidelines for building the font. 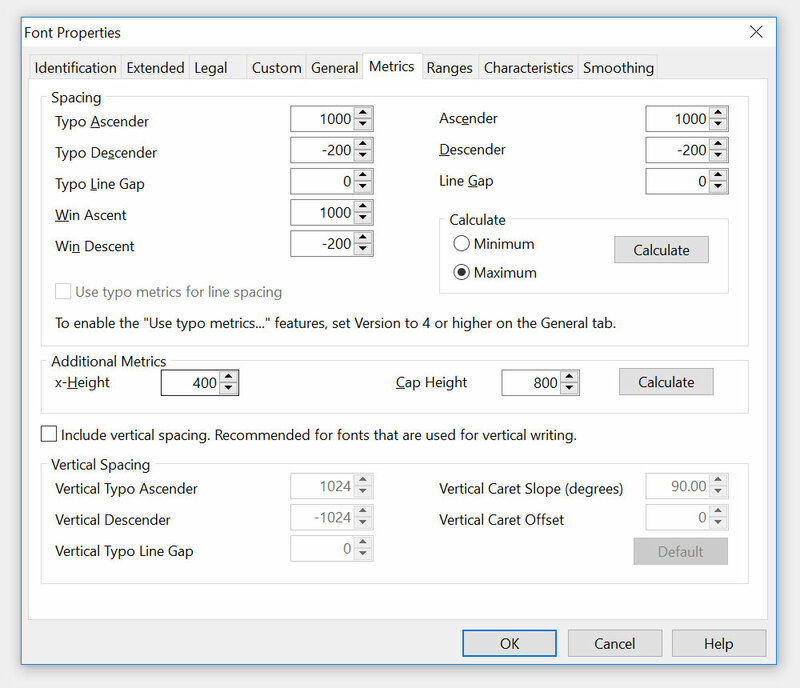 I have the Cap Height set at 800, with my ascenders at 1000 (200 above the Cap Height) and my descenders set at -200 (200 below the baseline). I like a Cap Height of 800 because it’s easy to divide into halves, quarters, and eighths. I won’t do anything with the vertical spacing section at the bottom, since this is a font that will type out left to right. I have my gridlines set at every 100 units to (this is going to be a recurring theme) make the math easy. So my building areas are set for letters that are 8 blocks (800 units) tall, with 2 blocks (200 units) above and below for ascenders and descenders. I may adjust the metrics at the end if I go over the top or below the bottom with some letter shapes, but for now, this will (say it with me) make the math easy. Our font file is set and ready (And saved; you’re saving as you’re going, right? ), so now we can start making our basic geometric shapes that will be the building blocks of the font. As you may have noticed, most sans-serif fonts (but not all) have the same stroke width throughout, while most serif fonts (but not all) have thicker and thinner strokes. And slab serifs, which is what I’m going to make here, can go either way. Since I’m looking to Cooper Black for my inspiration, I see that it has varying stroke weights, so I’ll have those as well. I did some test letters, and came up with sizes I like — my thicker strokes will be 180 units wide, and my thinner strokes will be 100 units wide. To accommodate the landscape-oriented nature of my blog post images, I’m going to build these sideways. 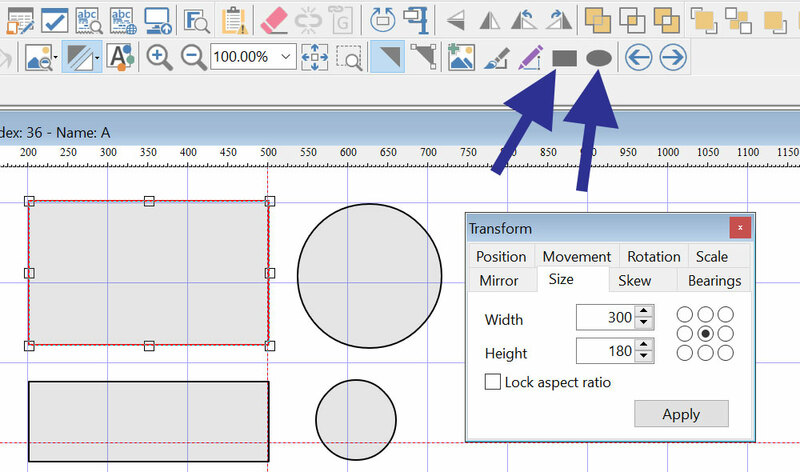 So I’ve created rectangles and circles (see blue arrows for the rectangle and circle tools in Font Creator) that are 180 units tall and 100 units tall. Next up, I’m copying the circles and making exact half-circles from them. I’ve just selected the points (which highlight as large green circles) and handles (which highlight as smaller blue circles) and deleted them from my copies. Since there aren’t handles coming off the right side anymore, the top and bottom points just connect with a straight line. I’m attaching a half-circle to each end of a rectangle. I’ll make sure they’re aligned horizontally with each other (the arrow on the right) and then unite them together to form one shape (the arrow on the left). Here’s a weird thing — usually when two shapes overlap in Font Creator, you’ll see little red Xs where the overlaps happen. You can see it happening on the right side of this shape, where the half-circle is just barely overlapping the rectangle. But those aren’t showing up on the left side. I love it when that happens—it means those two pieces are so precisely aligned that they’re touching but not overlapping. Both sides will merge in together well—the overlap on the right side is so minuscule that it won’t matter. You’ll see a lot more of those red Xs come up in soon, when we start building letters. The one on the right has straight lines, and would use these rectangles exactly as is. But if you look close at the one on the left, you’ll see that the strokes curve inward on themselves just a bit near the middle, then expand out just a bit at the ends. Doing this adds a little extra bit of fancy design, but it’ll mean more work. Of course, everyone preferred the one on the left. So, let’s make these shapes a little more hourglassy! First, I’m positioning this rounded rectangle in a spot that will make this easier for me. I’m placing it 10 units below the baseline, so I can use the baseline as a gauge to see when I’ve curved the line upward 10 units. Next, I’ve clicked on that bottom line, and I’m dragging it upward to create a curve. You can see that a handle has appeared in the middle of the long stroke where I’m pulling it upward. Once I have the curve hitting the baseline, I’m adding in extra handles on the right and left ends. These will help smooth out the curve as it comes around the circle end and goes into the slight indentation along the length of the stroke. What happens if you don’t include those extra handles? This is what happens. You get a tiny sharp point where you’d rather have a smooth curve. Some designers would be OK with this, and would let it go. I’m not one of those designers. You can see that I’m getting red dots where I’ve made these curves. 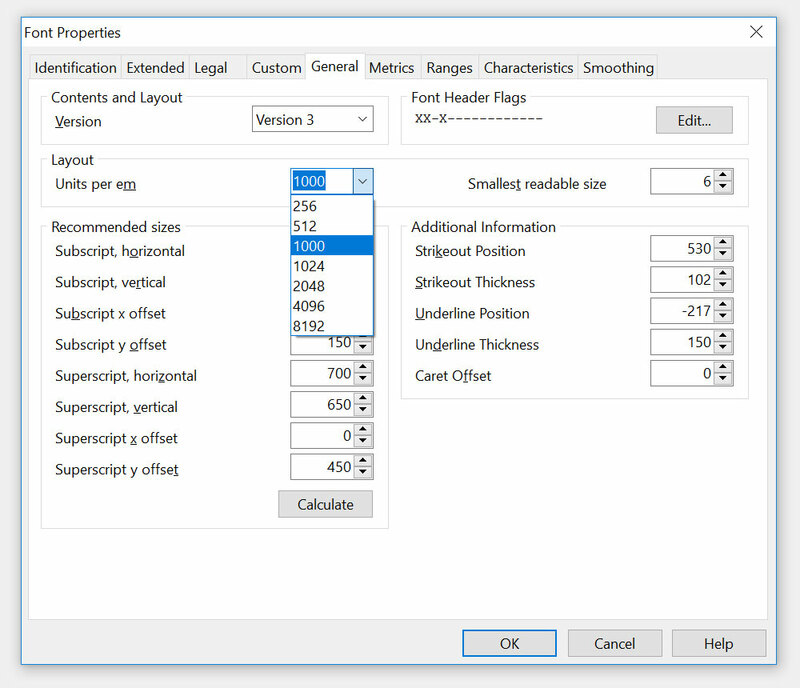 This is Font Creator telling me that I’m missing points at the extrema. The extrema are the areas at the farthest spots (the extreme spots, if you will) on the left, right, top, and bottom of all curves. A font can totally be created and used without points at the extrema, but I prefer to fix anything that Font Creator tells me is any kind of a problem, including this. So, I’m going to click on the Optimize Contours button (see blue arrow), which will smooth out any weirdness and put points at the extrema if they’re missing. Easy cheesy! I’ve also created a shorter round-ended rectangle, the same 100 unit-size as our thinner stroke, that I’ll be using for my serifs. These are all the parts we’re going to need to construct a ton of our letters! 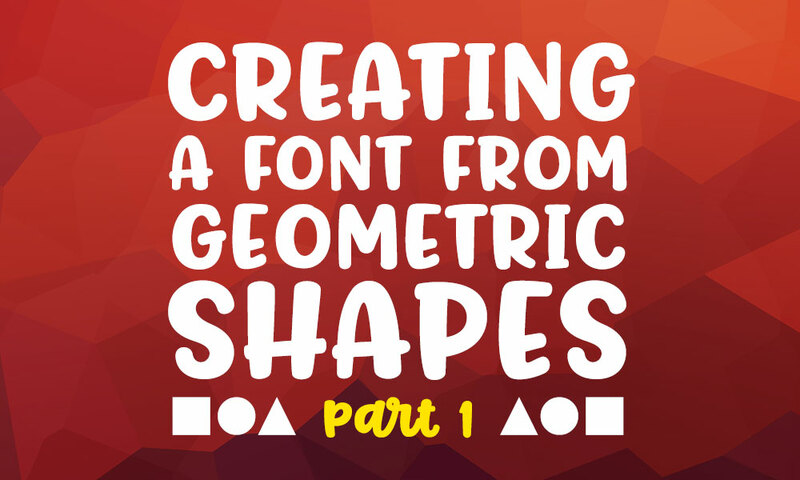 ** Next up in part 2, we’re going to make a couple more basic shapes, and then start making letters from these parts! Go read it now!